Do you think he had one? 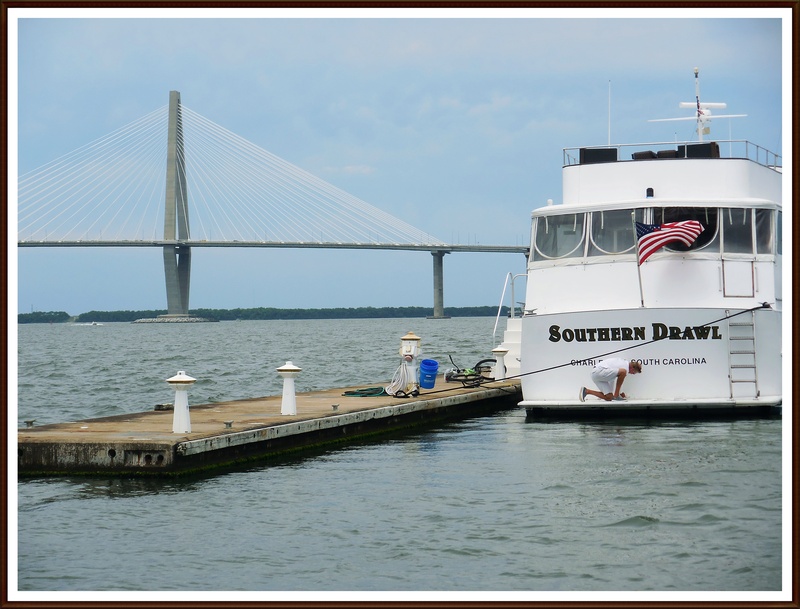 A southern gentleman makes me go weak at the knees, especially rich ones with boats… I am still in Charleston on the Cooper River and I love this shot with the astonishing Arthur Ravenel Jr. Bridge in the background. 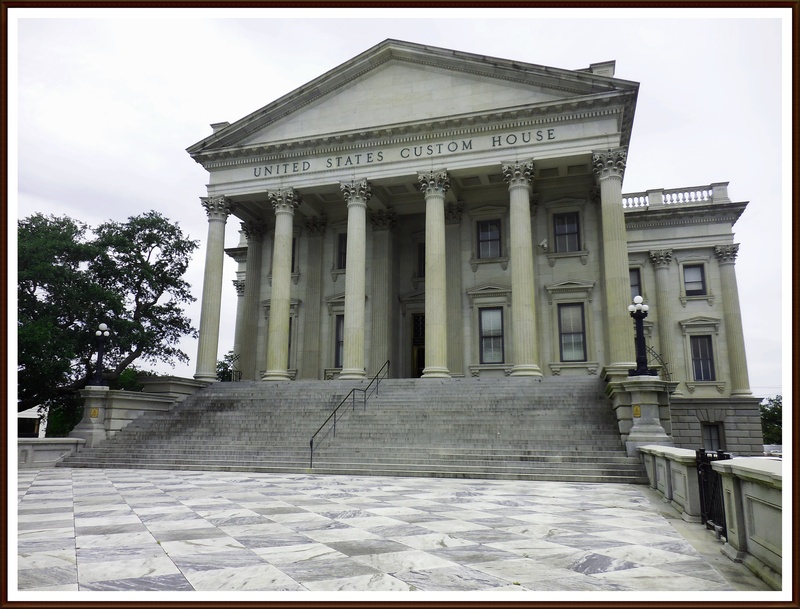 The Custom House reveals how much money was and still is made currently on the waterways of Charleston. Such an impressive building. I watched with fascination at this sailing club out on the river – who the heck would take out boat #13. I thought sailors were superstitious? 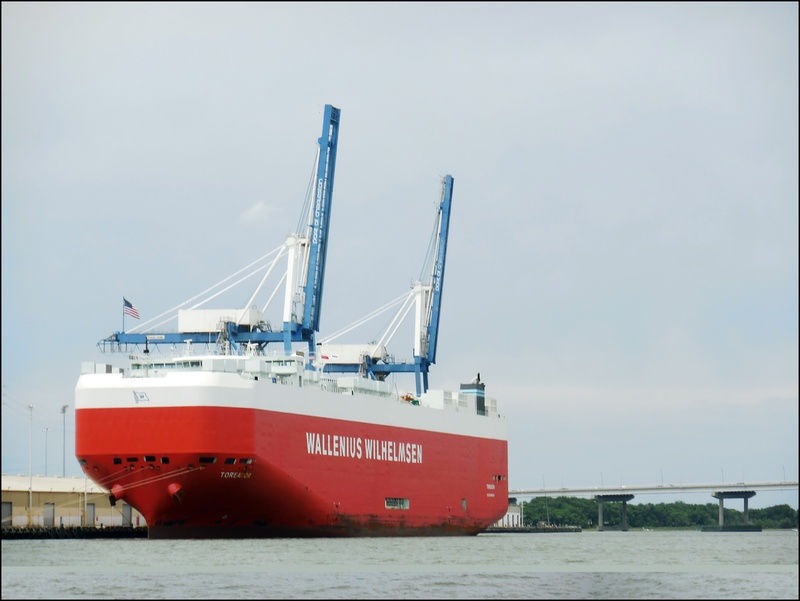 It isn’t the southern waters unless there is a pelican. I love these friends just chilling together on a hot day. Kerry was stood up – WHAT????? 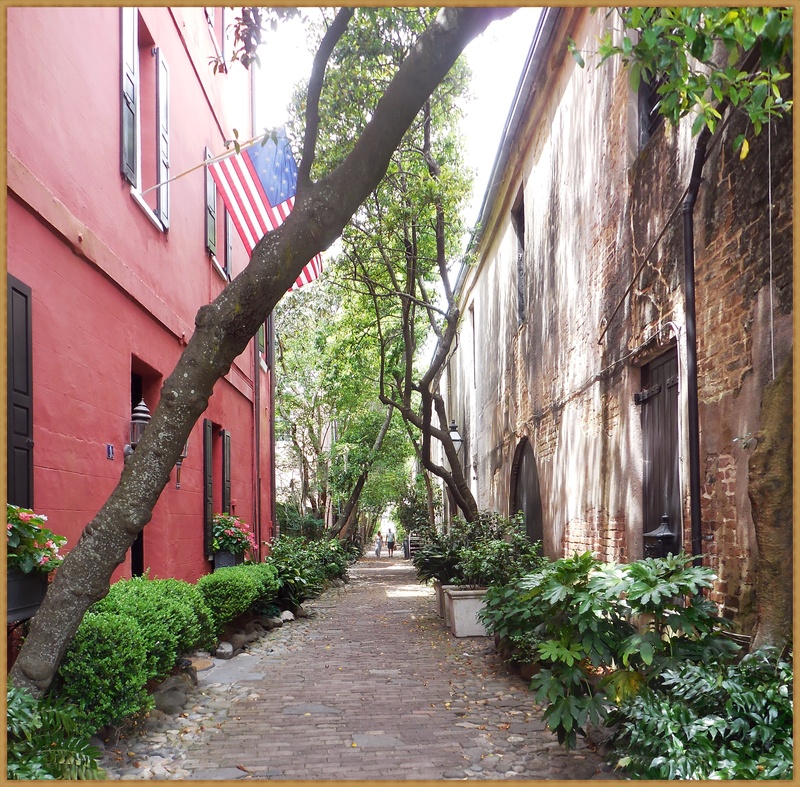 The person that took this photograph of me in Charleston STOOD ME UP! I don’t recall ever being stood up before and especially not by a woman. 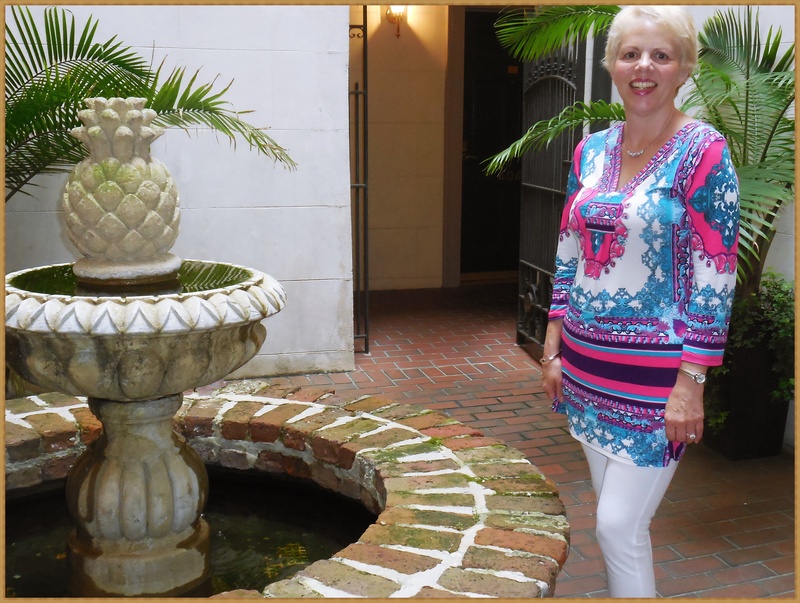 Before your imaginations go off into the gutter about a bisexual fling in Charleston, it was just another lady guest at our beautiful hotel, The Fulton Lane Inn. I booked the hotel on Hotwire with one of those ‘don’t know which hotel is until you pay for it’ and was astonished at what a good deal it was. 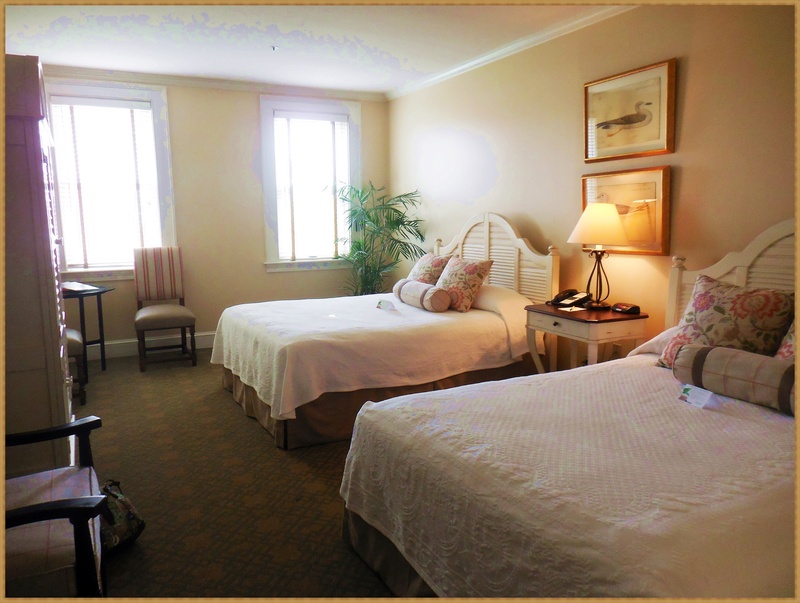 The hotel was right in the middle of historic downtown, perfect for a short stay. To be honest, I expected it to be run down with cockroaches but it was truly a 5 star experience! To start with there was a complimentary breakfast which you could have delivered to your bedroom (for no extra cost) or eat in atrium of the main hotel, The King’s Courtyard Inn, where I am standing. Not only that, it was delicious – fresh pastries, juice, coffee, oatmeal, fruit etc. From 5 – 6 pm they had wine and snacks (also complimentary) in this atrium area, followed by dry or sweet sherry at 6.30 pm which you could take up to your room. This had to be a bargain break for me because Teddy had still not found work so it was perfect. So, back to my date, I met her the first evening and she offered to take my photograph. She was a lovely lady who was waiting for her husband sail the boat up to Charleston from Miami. We had plenty in common so she asked me if I would like to meet up the following evening. I didn’t really want to, not because I didn’t like her, but I just wanted to be free without a timetable. Politeness, however, made me say yes. I organized my day around meeting her then and she dumped me. My suspicion is that she looked at my blog and was put off by major depression or sexual fluidity! On the second night, it was very busy with hotel guests and I felt awkward saving a seat for my date when there was a shortage. Eventually, I realized she wasn’t coming but that didn’t stop me talking to almost everybody. There were Americans, Germans and English people. I mentioned to one lady that my husband was adopted and she snuck away from her husband and mother to share a secret with me. A previously unknown son of her husband had turned up at their door. He wasn’t even aware of the son’s existence and hadn’t told her mother who was sitting at the next table. Isn’t it amazing what people share with strangers? Or is it just me? There was a nice looking man sitting on the fountain so I just predated smiled at him instead. He was from Dallas, happily married and ‘bought’ me a glass of wine (you were obliged to tip the young server). We had a nice chat, he went to do some work emails and I went out to another river view rooftop bar for dinner. The first evening, I went to this lovely bar below at the Vendue Hotel. I loved looking one way at the water and the other at the historical spires – magical. 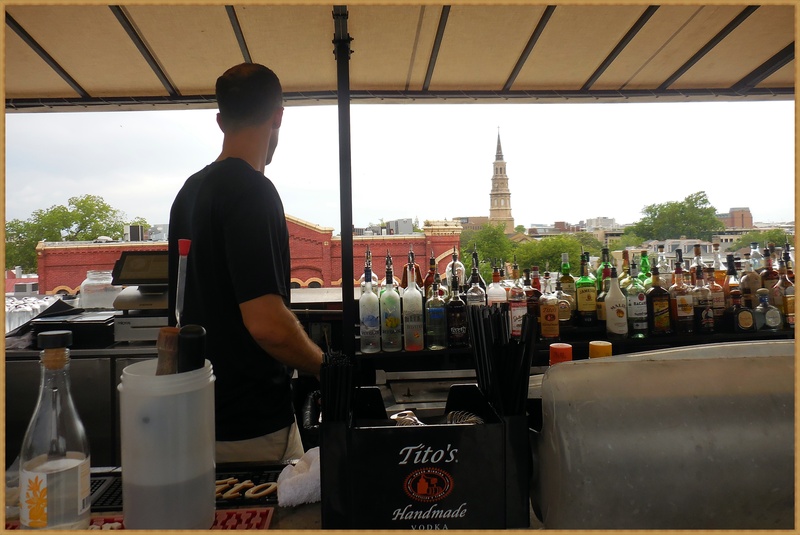 The second rooftop bar was enclosed and less enjoyable but the food was good. I watched a Queen Bee of a medical practice hold court over all her male worker bees that had bow ties on – fascinating! Never has a street been more aptly named. There was one wonderful church after another. 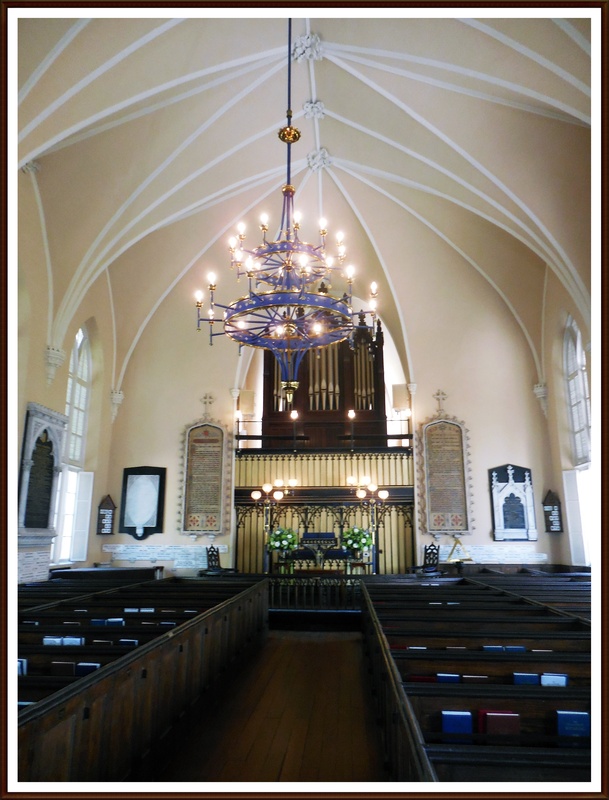 The title photograph is of the French Huguenot Church – it is simply known as that. I noticed it particularly because it is painted a delicate pale pink with black cornichons. The Huguenot’s were French Protestants who escaped persecution from the Catholic Church. I loved the way they embraced the Protestant ethic and yet created a house of worship with a certain French soupçon of elegance. Below is the exquisitely simple interior with a startling blue chandelier, accentuated with the blue prayer books. 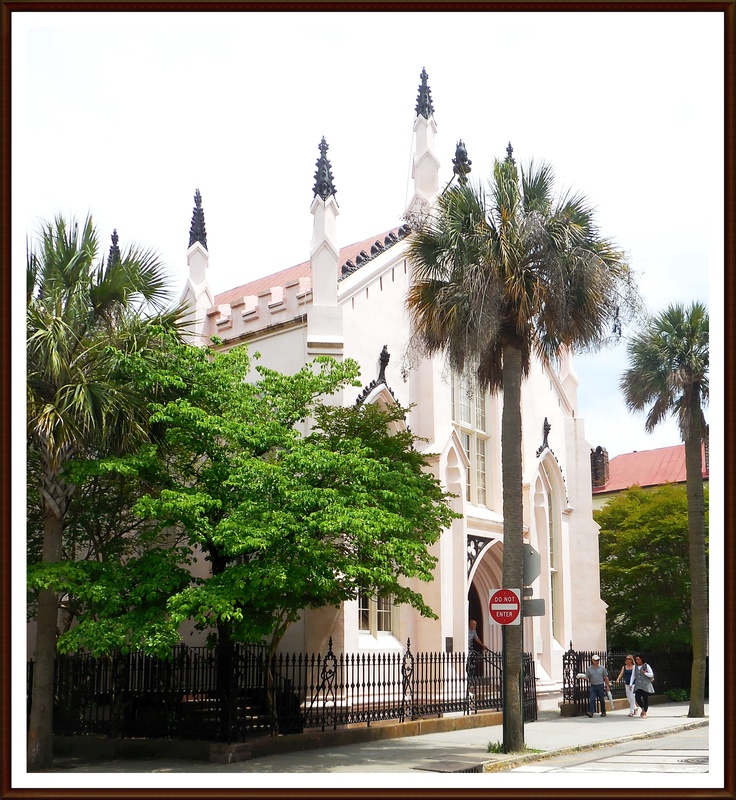 Above is St Philip’s Episcopal Church which is the grandest on the street. Another tourist later told me that the church keepers weren’t very friendly (well, they are Protestants – I am sorry but there is always a lapsed Catholic devil sitting on my shoulder). There is always a fine line between visiting a historic site and respecting that it is a current house of worship. No talking, flip-flops or chewing gum, please! 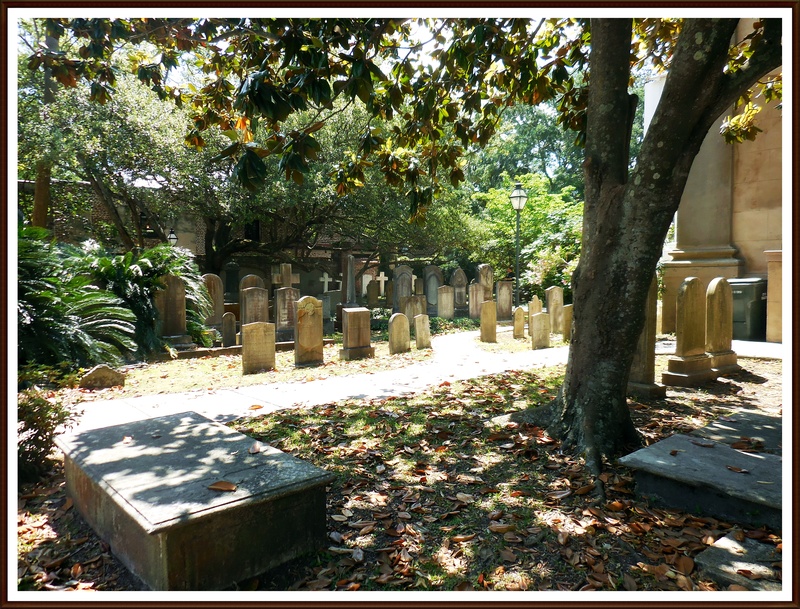 There were some very distinguished guests in the graveyard and it was so serene on a hot, steamy Charleston afternoon. 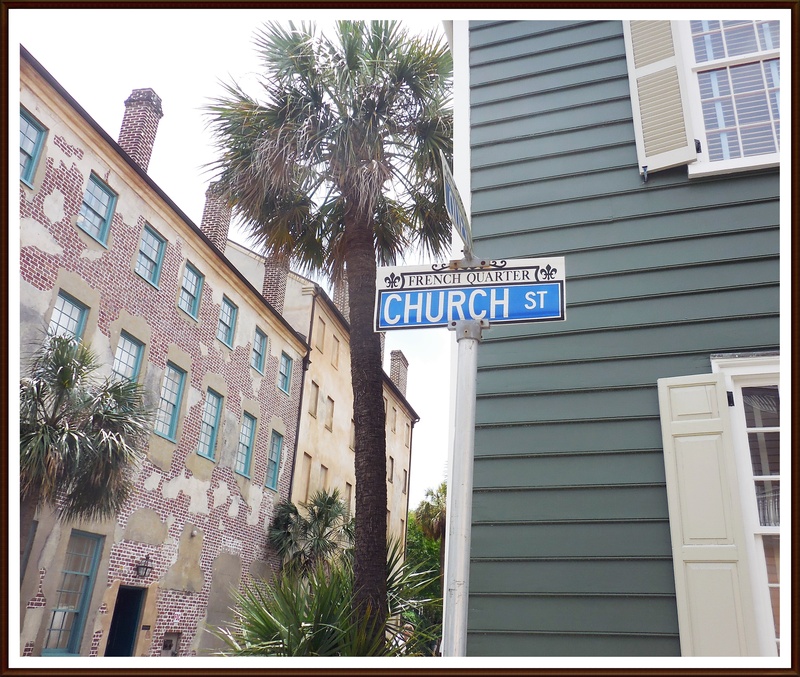 Both churches were in the French Quarter. The streets were a charming mix of old and new. 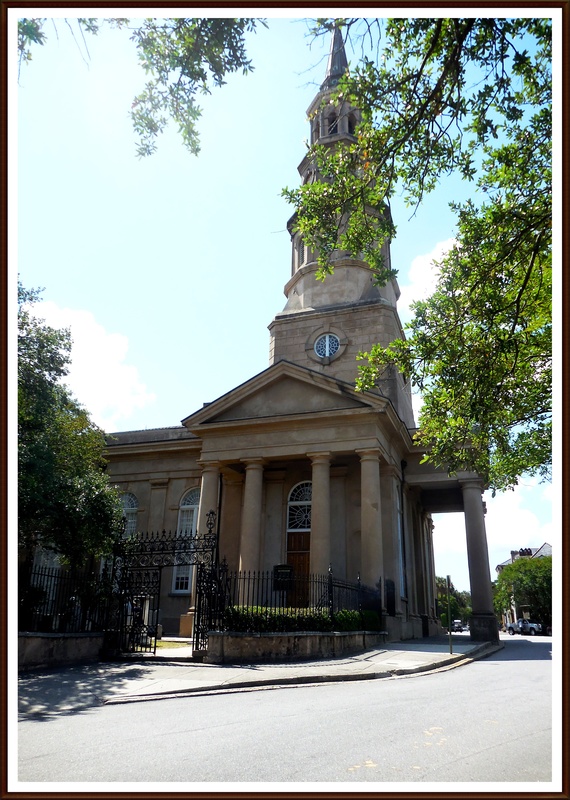 It was only after I left Charleston that I remembered about the Charleston Church massacre more than a year before, at the Emanuel African Methodist Church. The victims of this hate crime, their relatives and the people of Charleston give us something to aspire to in this horrific week. Dignity, sorrow and forgiveness. 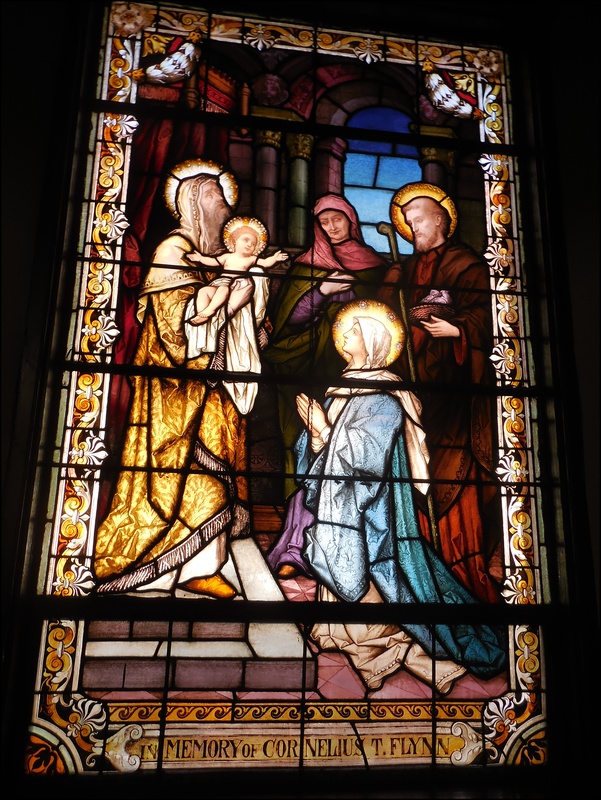 This is a beautiful stained glass window in St. Mary of the Annunciation’s Catholic Church, the first Catholic Church in South Carolina. 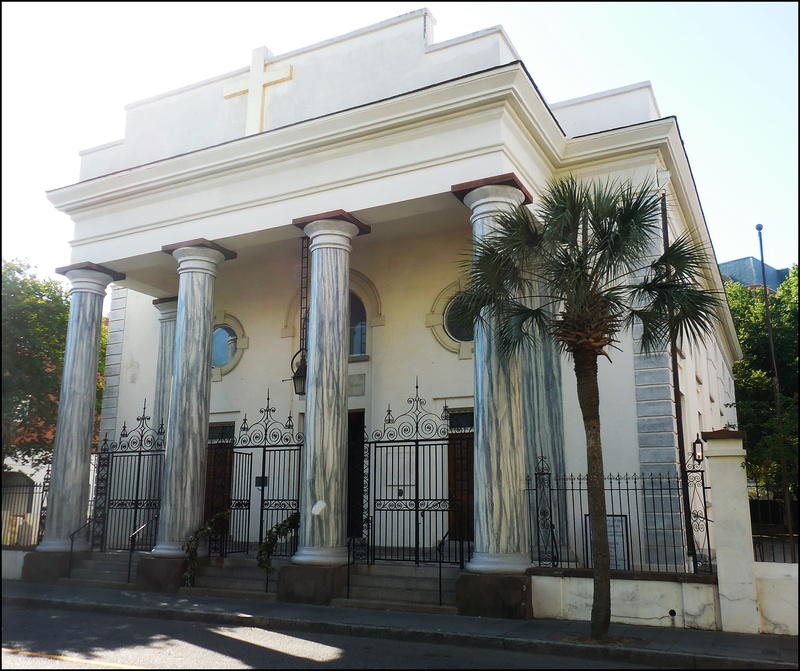 The original building was founded in 1789 but this is the third church on the same site. It is quite an unusual architectural design for a Catholic church and I don’t think I have ever seen one quite like this. I went early to visit and to my delight was the only person there. Old churches and mosques can be so busy with tourists that you miss the reverential feel of an ancient place of worship. I went straight to light a candle and this time I prayed for everyone. 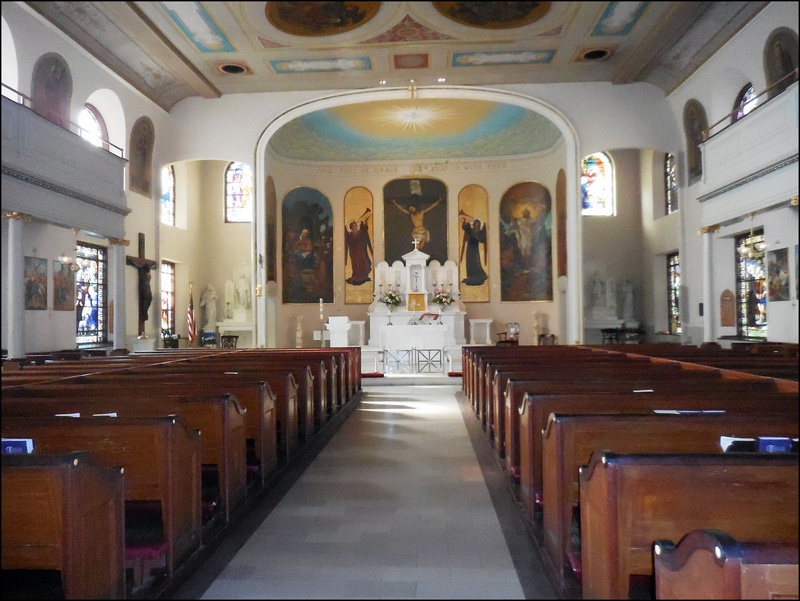 The church was relatively small but so beautiful, especially inside. Just as I left, I remembered to bless myself from the font and be grateful for all that I have. 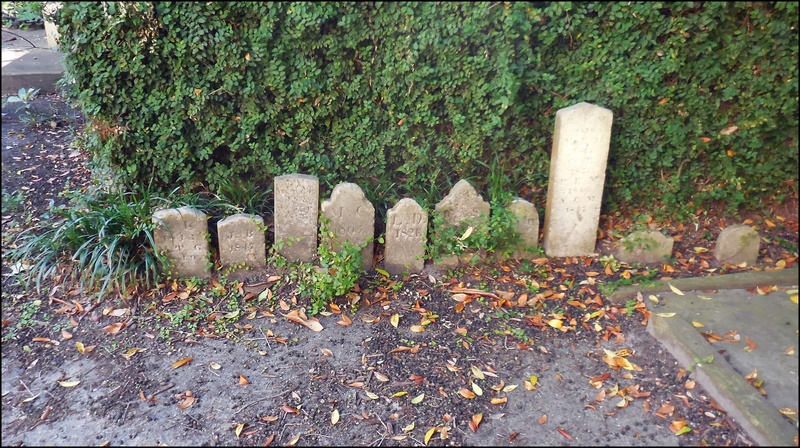 Behind the church was a lovely little graveyard but these were the saddest little gravestones I have ever seen. 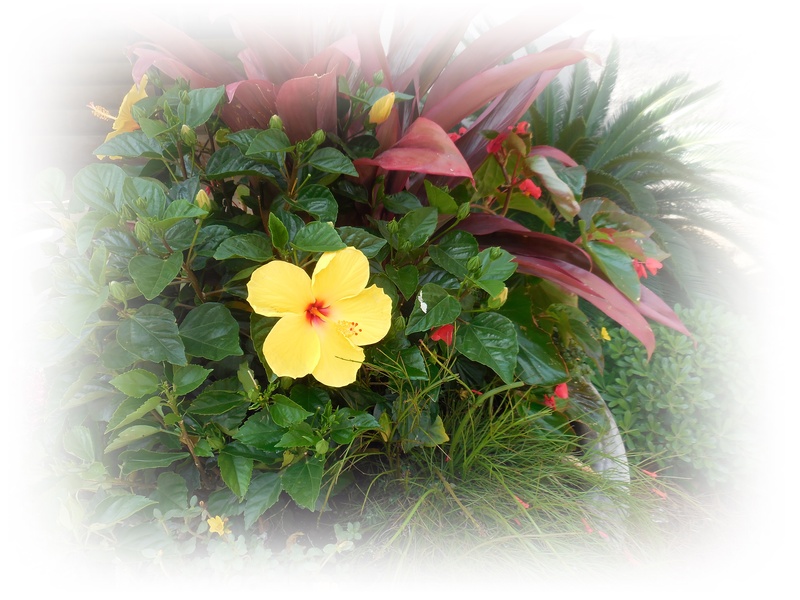 They must have been for stillborn children because there was no name, just a single date. So sad, and yet touching that they had been remembered in this way. My maternal family name is McHugh, it is an Irish name and not that common with that spelling. 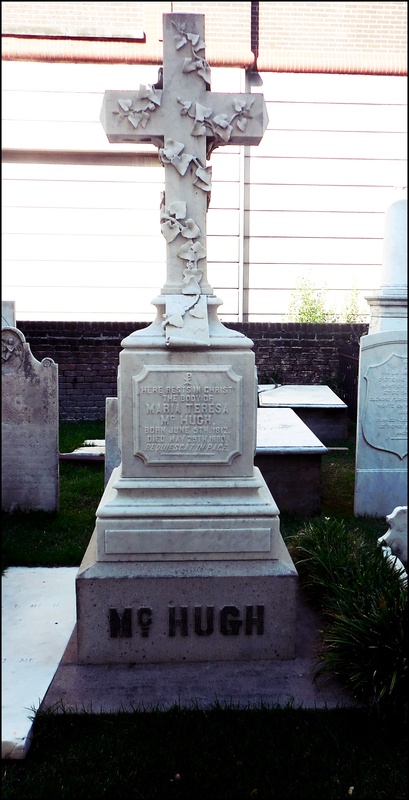 So, at least one of my namesakes had money because this is a fancy memorial. 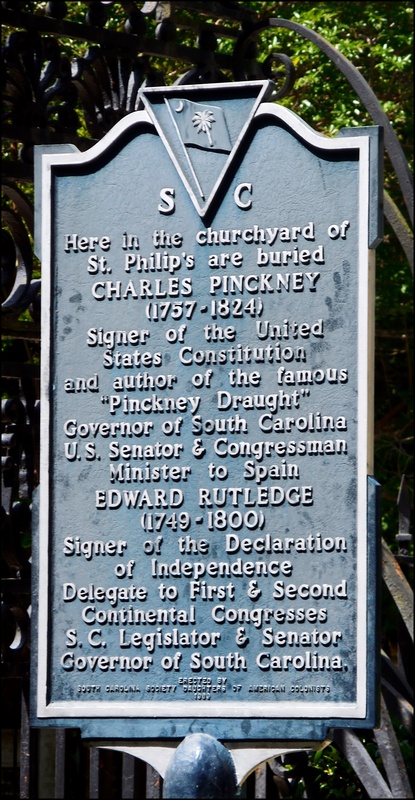 Charleston is full of churches of every denomination and I tried to visit as many as possible, including their fascinating graveyards. More in the next post. Do you see the dolphins? Bloody dolphins! I know they are invisible but there is a mummy dolphin with two cute little babies, diving in and out of the water. Diving in precisely when I took each shot… Despite my fear of deep water I love to be near it and took advantage of a little water taxi service in Charleston that takes you upriver to the Aquarium, across the Cooper river to Patriot’s Point where the USS Yorktown Aircraft Carrier is now a military museum, then to the Marina, and then back to the center of the Historic district. It was $10 for all day use and I just loved it. 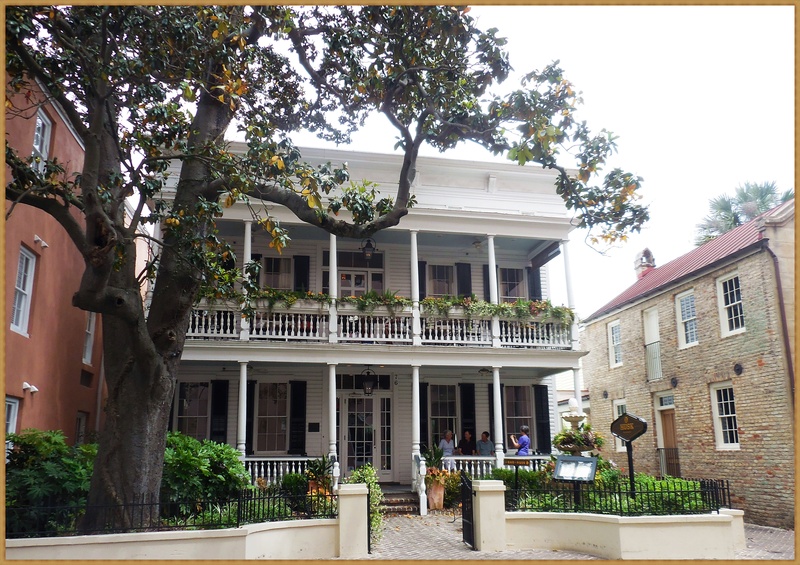 Charleston is a peninsula, with two rivers on either side leading out into a wide estuary and then into the Atlantic Ocean. It was curiously hot during my stay and very humid (even more than Houston) and the water was soothing to both my dry eyes and soul. My desperation to snap more dolphins made me put up with being in a tiny boat across a major shipping lane – eek! 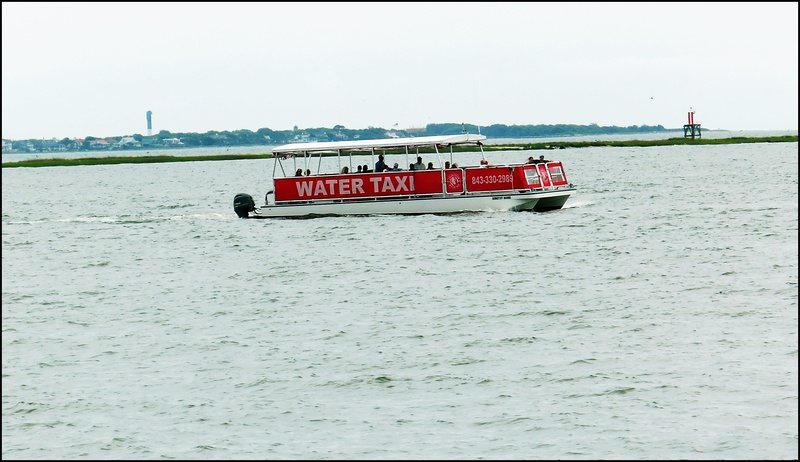 This is how deep the Cooper river must be…. When we lived in the north of Scotland (for almost 20 years) we were close to the Moray Firth, home to the most northerly group of bottle-nosed dolphins. The water is warmed by the North Atlantic Drift supporting plants and creatures that would normally not live in such a cold climate. Despite being on the coast thousands of times we only saw the dolphins ONCE! I am sure they were always there, laughing hysterically as they do, hiding when we watched for them. They had a bad reputation as fearsome predators and would regularly beat up the poor little porpoises. It was man’s fault, as ever, because we had over fished their territory and there was a battle for food. 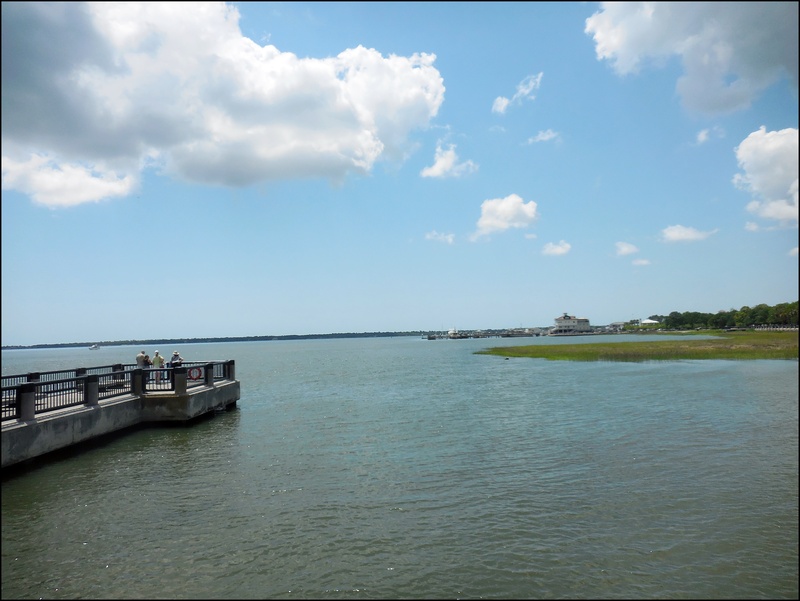 Back to Charleston – those too are Atlantic bottle-nosed dolphins. 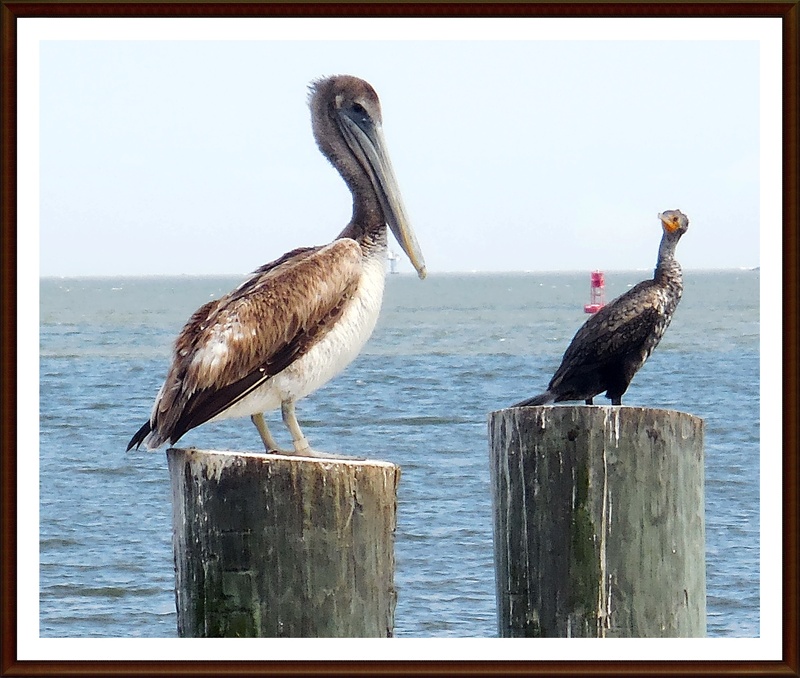 The rivers and estuaries are home to all sorts of seabirds and fish. It was a seafood lover’s paradise which was wasted on me but I did enjoy some really delicious food. Between the sea and the sun, I and every other tourist was as brown as a berry. 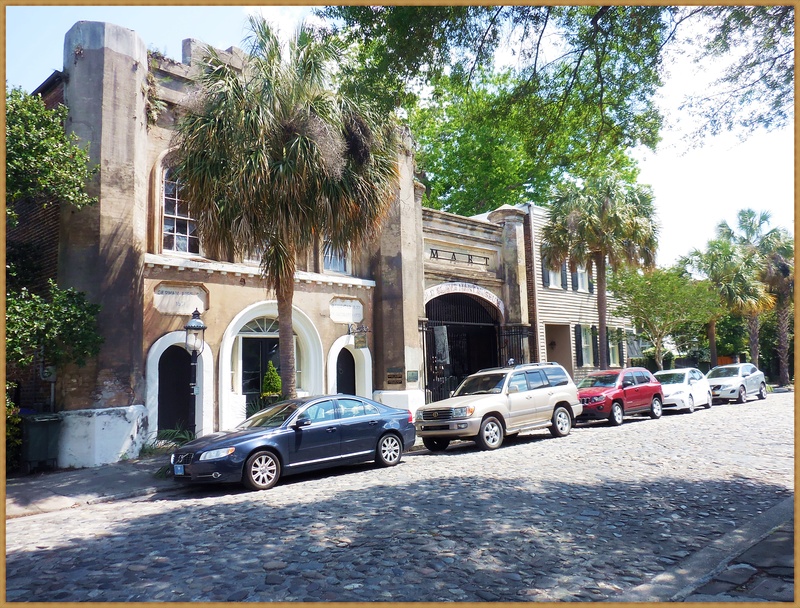 There is no need to have a car in downtown Charleston as there are free bus services and easy walking with sidewalks everywhere. I didn’t notice many overweight people – it was quicker to walk to your destination than wait for a bus. It was a very short visit but I would have loved to have visited a plantation and got out into the real countryside. On land for the next post but one last action shot from the person who is terrified of deep water. 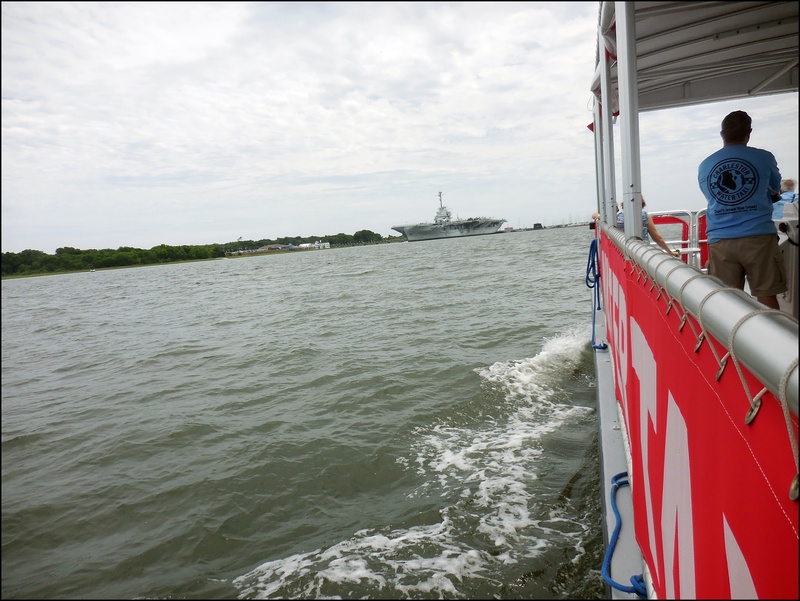 I was leaning right over the taxi to get a shot of USS Yorktown.